Ride-hailing firm Grab is opening a new Singapore headquarters at one-north business park by the fourth quarter of 2020. Spanning 42,310 square metres, this new building will be Grab’s largest R&D centre, which can house up to 3,000 employees. Grab currently has 1,500 employees across its four corporate offices in Singapore and it plans to double its headcount by the end of next year. 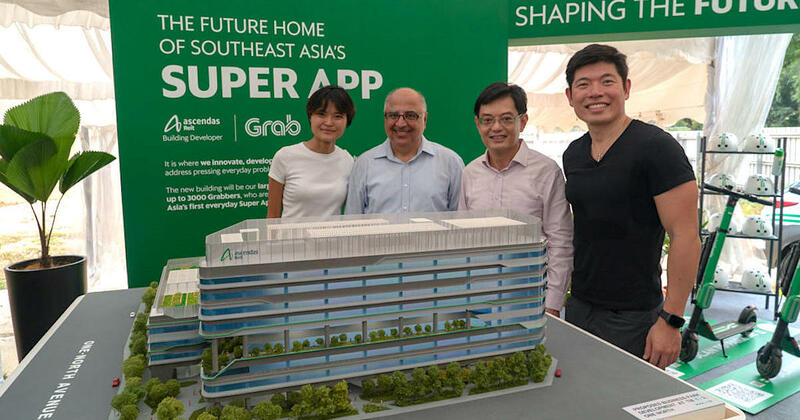 All of Grab’s employees will be housed in the new HQ once it’s completed. This year, Grab will also be employing an additional 1,000 tech talents globally, including data scientists, artificial intelligence researchers, engineers, designers and product managers,” said Anthony Tan, co-founder and CEO of Grab. The tech talents will be working at one of Grab’s seven R&D centres in Singapore, Beijing, Seattle, Bangalore, Ho Chi Minh City, Kuala Lumpur and Jakarta. “Singapore is our strategic base from which we have grown from a ride-hailing service provider to the leading super app in Southeast Asia,” said Lim Kell Jay, Country Head of Grab Singapore. In conjunction with the launch of its new HQ, Grab has also rolled out Batch 2 of Grab Ventures Velocity (GVV) programme to grow the tech startup ecosystem in Singapore and across Southeast Asia. GVV was first introduced in June 2018, and is Grab’s flagship scale-up programme for post-seed startups to test and commercialise their solutions with Grab’s customer base. With support from government agencies from the region, the first batch of GVV has seen successful outcomes. A couple of the participating startups have recorded over 70 per cent increase in business during their pilot on Grab’s platform. Applications for the second batch are now open until 15 May 2019 to startups across Southeast Asia. Empower farmers – The first track is for startups with ready solutions that can disrupt the traditional fresh groceries supply chain. These solutions will enable farmers to bring affordable and high-quality fresh groceries like fruits, vegetables, and meat to customers. Empower small businesses – The second track seeks innovative solutions that will help to digitise small businesses, enabling them to lower costs, simplify their operations and earn more. This track is powered by Kudo and startups will pilot their solutions with Kudo’s agent network in Indonesia. Selected startups will be given the opportunity to pilot their solutions with Grab’s users and merchant partners. They will also get access to Grab’s internal and external network of C-level advisors and experts. On the technology front, the startups will leverage GrabPlatform resources, such as Grab’s cloud APIs, to accelerate their product development. If they are successful with their pilots, up to two selected startups will receive partnership opportunities to scale their business with Grab. “We recognise the challenges that startups are facing. Scaling up supply and demand and platform operations simultaneously is both a time-consuming and an expensive problem to solve,” said Lim. To apply to GVV Batch 2, you can do so here. Grab will be rolling out a new public transport planner feature in its app within the next two months. The trip planner feature is similar to that of Google Map’s — it will suggest different traveling routes that include buses and trains, as well as the estimated travel time. The idea is to allow users to easily compare different traveling options on one platform, said Ngiam Xin Wei, head of shared mobility at Grab. Grab is also looking at integrating Grab’s e-wallet GrabPay to allow users to pay for public transport via the app.